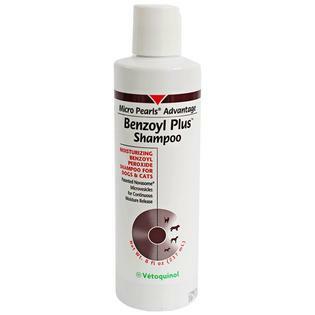 Micro Pearls Benzoyl-Plus Peroxide Shampoo for Dogs and Cats is ideal for pets with excessively greasy or oily skin, bacterial skin infections, comedones (blackheads), or plugged hair follicles. The gentle formula degreases skin without excessive drying. 2.5% Benzoyl Peroxide delivers keratolytic antibacterial degreasing and follicular flushing action. Suitable for pets with folliculitis, oily skin with flaking (Seborrhea Oleosa), and yeast (Malassezia) overgrowth. Benzoyl Plus is a remarkable breakthrough in animal health care technology, containing microtargeted NOVASOME microvesicles and the recognized bacteria fighting ingredient benzoyl peroxide. The Novasome microvesicles are designed to deliver long lasting moisture to the hair shafts and epidermal layers. These microvesicles counteract the drying effects of an oxidizing benzoyl peroxide shampoo. Novasome microvesicle technology moisturizes skin with continuous release hydration. Ingredients: Contains 2.5% benzoyl peroxide in a mild shampoo base containing water, decyl polyglucose, glycerin, carbomer, tocopheryl acetate, glyceryl stearate, sodium hydroxide, dimethicone, cholesterol, C12-15 alkyl benzoate, potassium oleate, propylene glycol, nonoxynol-20, octoxynol-5, methylchloroisothiazolinone, methylisothiazolinone, tetrasodium EDTA.